Device 4: By working them to make false inferences from those blessed and glorious things that Christ has done. “Honey, please set the dinner table,” says the mother to her son. “In a minute,” he replies, never taking his eyes from the television. “Will you play catch with me, Dad?” says the boy. “Maybe tomorrow,” mumbles the father from the sofa. We humans are experts at delaying, deferring, and avoiding. We want what we want. And when others’ wants conflict with ours, we find ways to win. When it comes to responsibilities, we tend to look for the “not yet” clause. Christ’s call upon his elect is not easy. It demands action. It requires service and devotion. It cannot coexist with complacency. The Puritans are famous for their emphasis on diligence and work. “Idle hands are the devil’s workshop,” don’t you know? And yet while it’s easy to chuckle at the extreme, we cannot deny the value of faith-fueled work. 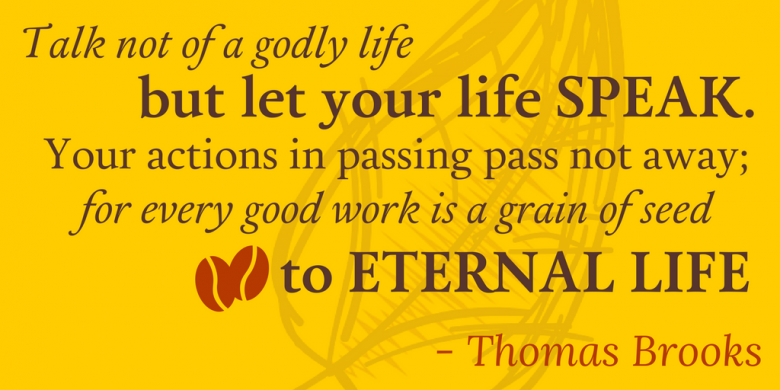 Thomas Brooks warns us that Satan wants us to infer an entitlement to laziness. He tempts us to believe that because Christ has won the victory for us there are no battles left to fight. But common sense and Scripture soundly refute such notions. Allow Brooks to explain his remedies against idleness, to help you recharge your devotion to Christ and banish the enemy from this playground once and for all. The apostle Paul’s pastoral letters are some of the most brilliant theological tractates ever written. They are also full of the Holy Spirit’s power and inspiration. In them Paul deftly handles both doctrinal indicatives (what is true) and imperatives (what we must do). Here is what is true about us because of what Christ has done. Here is what we must now do in light of this truth. Problems arise when we favor one of these emphases in neglect of the other. If we only teach the indicatives of Christianity, we fail to lead others in that joy-fueled diligence toward godliness. If we only teach the commands of Christ, we chain believers to a joyless toiling that will result in frustration and despair. To these quotations I will add one more, from the apostle Peter. The first chapter of his second epistle is a perfect example of the indicative-imperative balance. Let’s take a look at verses 3-8. Indicatives: His divine power has granted to us all things that pertain to life and godliness, through the knowledge of him who called us to his own glory and excellence, by which he has granted to us his precious and very great promises, so that through them you may become partakers of the divine nature, having escaped from the corruption that is in the world because of sinful desire. Imperatives: For this very reason, make every effort to supplement your faith with virtue, and virtue with knowledge, and knowledge with self-control, and self-control with steadfastness, and steadfastness with godliness, and godliness with brotherly affection, and brotherly affection with love. For if these qualities are yours and are increasing, they keep you from being ineffective or unfruitful in the knowledge of our Lord Jesus Christ (2 Peter 1:3–8, ESV). Note that Peter says at the end of this passage, “these qualities” will help the believer remain effective and fruitful “in the knowledge” of Christ. Knowledge of him who saves must always come first. It is in the knowing and believing where we find the motivation to add the qualities that follow. Note also that the imperatives begin with faith. It is the possession to which all other qualities are added. And remember, Paul teaches in Ephesians our faith is a gift from God, his work alone, not anything in which we can boast. Therefore all faithful effort and toil is the fruit of that gift, rooted and grounded in the love of Christ and the power of his work for us. Finally, circling back to the beginning of this passage, it is through God’s power that we receive all these qualities, everything we need for life and godliness. He truly is the source both of the basis of our works in Christ and the ability to walk faithfully in those works. We must pay equal attention to the indicatives and imperatives of Christ’s Word. Do you remember when the “pay it forward” movement swept the nation? People everywhere were suddenly moved toward random, or perhaps even planned, acts of kindness toward strangers or community members for a time. This notion is not a new one. There are references in literature and history to the idea of responding to one’s kindness by like kindness other than reciprocation going back centuries. But it was the 2000 motion picture of the same name, based on a novel, that spurred on the national beneficent conscience. Starbucks patrons paid for the order of the car behind them in the drive-through. Others placed vouchers for food or other goods inside library books. Still others gifted needy neighbors with free oil changes, new tires, or other auto maintenance. The idea behind all this paying it forward is using the gratitude one feels for being helped to motivate helping someone else. It is an understanding that paying someone back isn’t always the best, or even a necessary, response. The next greatest need may be ahead of you, not behind. Do we comprehend that this is how things are with God as well? The idea that we must do good deeds to keep God’s favorable view on us is deeply ingrained into Western culture, even beyond Western Christianity. Regardless of the number of times we hear the gospel, we still find it hard to believe that God’s gift of grace is free and unmerited. In Matthew 25 Jesus tells two parables about readiness: the parable of the ten virgins and the parable of the talents. Both explain what kind of servants he expects his children to be. But prior to this, at the end of chapter 24, Jesus explains what it will be like when he returns. This is not a parable. Jesus uses no similes or metaphors here. He simply warns that we are not to be lazy, taking advantage of his seeming delay. An unfaithful servant who gives up his task shows himself to be a child of the devil, regardless of his profession of faith. His end will be just in light of the falseness of his position before God. Paul writes elsewhere urging believers to finish the course set before them. He closes his final pastoral epistle explaining that he has fought the good fight and kept the faith. God wants us to complete our journeys on earth as much devoted to him as when we began. It is not those who wandered and strayed that we refer to as “heroes of the faith.” It is those who stand strong, unwavering, unmovable. Paul, in his letters, names those who abandoned and betrayed him. Let us not be remembered for our starting but for our finishing. As Brooks so aptly warns in this remedy, we should never place our hopes upon our own good works as that which saves us. We are to look to Christ, our head, and the sufficiency of his works for our assurance. But we cannot err in judging our faith’s sincerity by our works. Christians – literally, “little Christs,” – walk as Christ did. In the same way children tend to take on the mannerisms and speech patterns of their parents, so we believers should increasingly reflect the qualities of our Savior. Consider a person who makes a New Year’s resolution to get in good physical condition. She invests in a gym membership, signs on with a personal trainer, and purchases athletic wear. She even writes ahead in her calendar all the dates and times she plans to exercise. One year later this person laments to her friend that she hasn’t lost any weight, has no energy, and still can’t fit into her favorite outfit. This is an absurd parable. (The kind Jesus told, actually.) But it literally describes many so-called Christians who profess their faith, join a church, and then never show any signs of active belief. Jesus fulfilled the promise of redemption in his death, burial, and resurrection. We fulfill the surety of our calling in our obedience and service to him. If a confirmation of our inheritance in Christ isn’t enough to move us to action, Brooks continues with a veritable features list of further benefits. It reads like the litany of specifications on a new car’s sales label. Show God how much you love him. Prove the sincerity of your obedience. Demonstrate you’ve been delivered from former sins. Profess the Holy Spirit dwelling in you. Silence those who call Christians hypocrites. Bring joy to disheartened fellow Christians. And so much more! It’s high time believers stopped seeing service to God as a duty and accept it for the privilege and joy it is. This does not mean service and devotion will always be easy or personally fulfilling. It does mean that it will always be worth the effort, will always reap blessings toward those we serve, will always engender the smile of God when performed in faith. Brooks, certain he has accomplished his persuasive task, leaves us with a reference to Jesus’ parable of the rich man and Lazarus. If his arguments won’t convince us, neither would someone rising from the dead. Let us hope it won’t take such a miracle to move us toward action. And yet the truth is that someone already has risen from the dead. And he is our motivation toward service. And it is he who we ultimately serve. I’m stunned. You mean God won’t do my homework? Seriously, this is good stuff. Thanks.